THERE'S definitely a change in the weather. As the colder months creep up on us, we thought we would dig into our favourite winter warmer recipes to share with you - and this week it's finger-licking-good ribs. If you do not have a pressure cooker for the recipe below, you can place the meat ingredients into an oven-proof dish, covered tightly with foil or a lid and slow braise in the oven for 4-5 hours at 140 degrees. 2 shallots, finely chopped for serving. Coat the ribs in plain flour. Using a pressure cooker, place sesame oil, onions, ribs and four red chillies into the pot. Stir to combine and coat the ribs. Add hoisin, soy, stock, balsamic and prunes, stir to combine. Lock the lid of the pressure cooker and bring to high pressure over high heat. Cook for 35 minutes, adjusting heat if necessary. Once done, remove from heat and let the pressure out of the cooker. Slowly release the lid, check to see if the ribs are tender. If not, lock lid again and return to pressure again for another 5 minutes. Transfer ribs to a bowl. Bring the sauce in the pot to a boil until it thickens. Season to taste, then strain. Place ribs and prunes back into pot and cover with sauce. Bring a large wok or saucepan of water to the boil. Add the bok choy and capsicum into a bamboo steamer and place over the boiling water. Steam for 3-4 minutes, then add the mushrooms and snow peas and steam for a further 2-3 minutes. Once cooked, transfer to a warm frying pan, add peanut oil, then add some sauce from the ribs mixture to the vegetables and toss through to stir-fry. 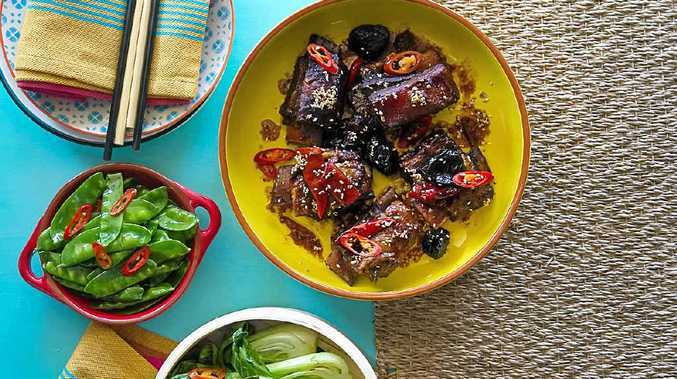 To assemble dish, place Asian greens on plate, place ribs with some extra sauce next to the greens and sprinkle with shallots and sesame seeds. Dan and Steph Mulheron won My Kitchen Rules in 2013. Visit http://www.danandsteph.com.au or follow them on Facebook - Dan and Steph - My Kitchen Rules.